This kit is a tribute to everyone's favorite "strippers' anthem". Naughty, fun and girly elements to have a great girls night out in the clubs. And yes, the stripper pole is included! New in store now! 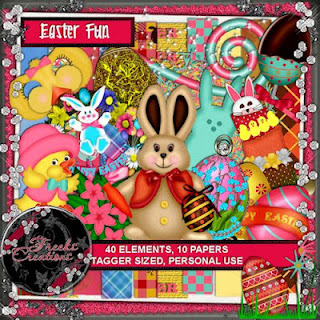 I wrote a tag tutorial, using the kit Fun Fun Fun by Wacky Winnie Designz. You can find the tut HERE on my blog. This is the second kit in my new Spring Medley Series. This kit is filled with the different hues of reds that return in the spring after a long winter nap. There is the brightest red of the cherries and the light red of the cute little bird strolling through the meadow. Scattered throughout the elements is the cherry motif, from the ribbon cherries to the little cherries in the bunny's paws. Along with the reds, you will see the greens and yellows used in the first kit of this series, Limeade. And to add a bit of whimsy, the cute little frog has his cherry picking hat on with his matching red bow. The little bunny is sitting down with two handfuls of cherries, ready to eat his sweet treat. 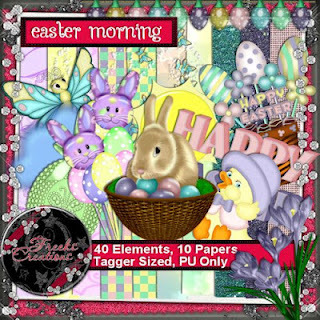 This is a wonderful kit to scrap a brag book, a badge album and of course, all those spring tags. It will mix and match nicely with Limeade. This kit is 800 x 800 pixels, 300 DPI. It contains 15 papers and 41 elements. Personal Use only please. Newest kit in store now! Introducing Limeade, the first kit in a new series that will showcase the colors of Spring. This kit is filled with the bright greens and sunny yellows that begin to appear as Winter gives way to Spring. Also making an appearance, or two, are the whimsical animals that can be seen throughout Spring meadows and lakes. And of course, the lime motif is scattered throughout the elements. This kit is perfect for tagging your Spring tags. It is 800 x 800 pixels, 300 DPI. It contains 15 papers and 50 elements. Color palette is included. Personal Use only please. 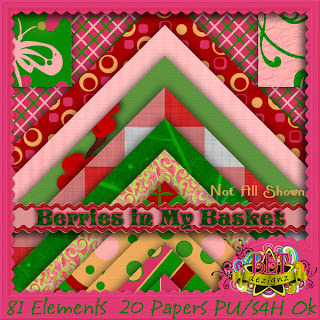 This kit is called Berries in my Basket. It is stuffed with very springy, “strawberry-ee” elements! It is available in Tagger Size Only, but it will be so much fun making those tags with this kit!! This kit has 20 800x800 Papers and 81 Elements. 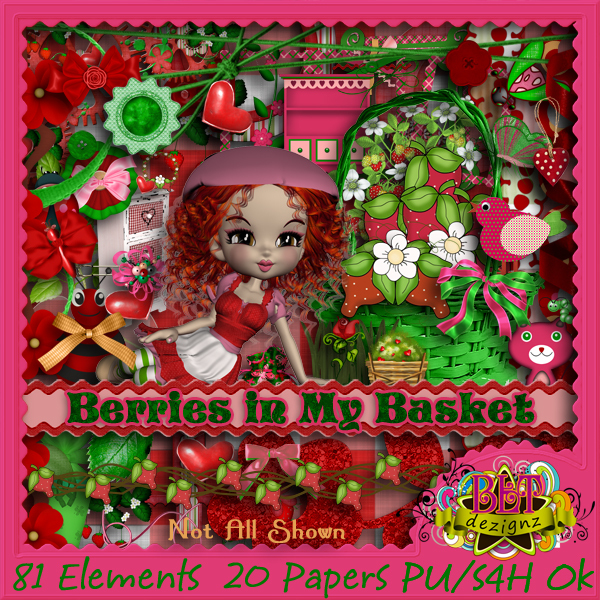 These elements included: a bag, basket, bee, beetle, bird, blanket, bling, 2 borders, 6 bow elements, 2 brackets, branch, 2 butterflies, 2 buttons, cat, caterpillar, clip, cluster, 2 Cookie Posers, curio, deco, 2 doodles, drawers, 6 flower elements, 6 frames, grass, 3 heart elements, highlight, journaling, ladybug, 2 leaves, leather strip, luggage, picnic set, pin, 3 ribbons, rope heart, rose, 4 strawberry elements, string, 2 swirls, tab fastener, 3 tags, teddy bear, umbrella, watering can, wire, and 2 wraps. Hello! This is my new mini at stores now. Let it Shine is the name. So colorfull, with so much fun! Happy scrapbooking. Soft, gentle colors and textures that reflect the richness of a good cup of coffee. This mini kit is ideal to scrap your favorite photos. This kit is 12 x 12 inches, 300 DPI. It has 4 ornate papers, 4 solid papers and 16 elements. Color palette included. Personal use only please. 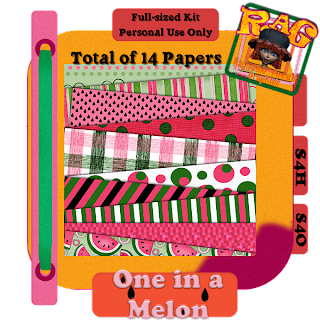 A "Melon" Themed, full-sized scrap kit with 14 Papers and 93 Elements! All elements are saved as transparent png files and papers are saved in jpg format. 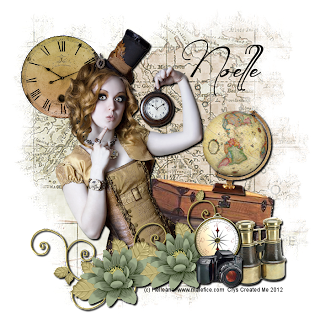 Everything is saved at 300 dpi, making if perfect for printing as well as digital scrapbooking. Enjoy! This is a pack of 6 papers which are just perfect for all your spring and Easter needs. There are vintage artworks, butterflies, handpainted tulips, all in beautiful pastels! These papers are CU4CU, CU, PU, SFO/SFH. All are created in 300 dpi full size and have slight texture/or embossing to them. 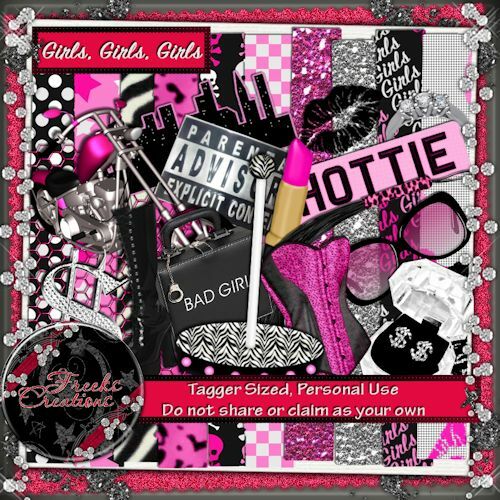 I wrote a tag tutorial, using the kit Lucky Girl by Karra's Kreative Korner. 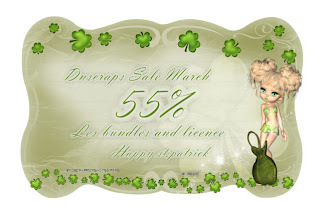 Hi, i have a new kit at the store, its to celebrate St. Patricks Day, hope you enjoy it! This kit was made with beautiful colors and have a lot of elements. 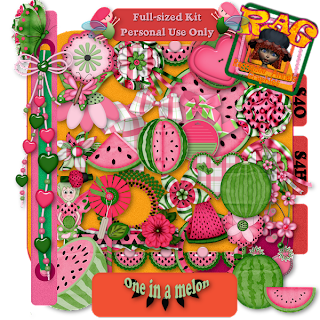 =)This kit is personal use, available on full and tagger size. kit was made with a beautiful color palette. I wrote a tag tutorial, using the kit New Voyager by Lady Noelle. 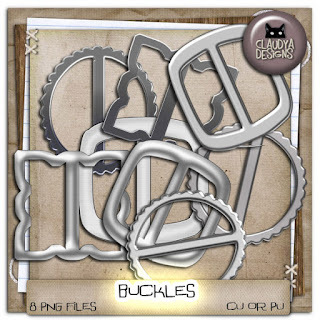 Buckles CU and PU at stores now! 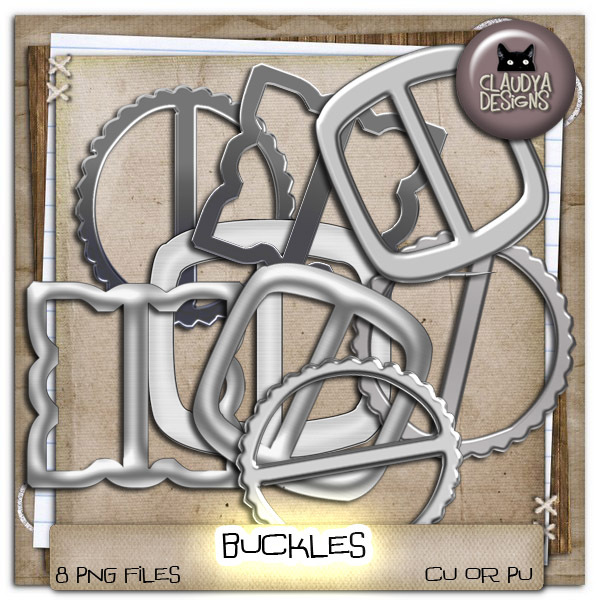 8 grey scale buckles at png format. Can color and resize according your creativity. 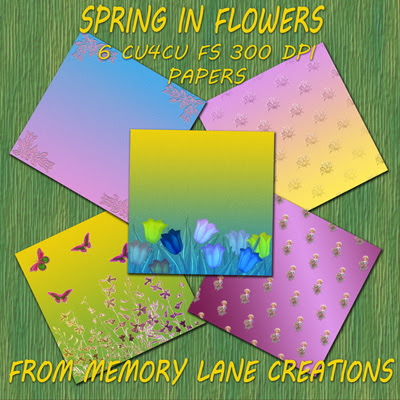 Hi, i have 3 new packs of papers, perfect for spring and seasonal scrap kits. 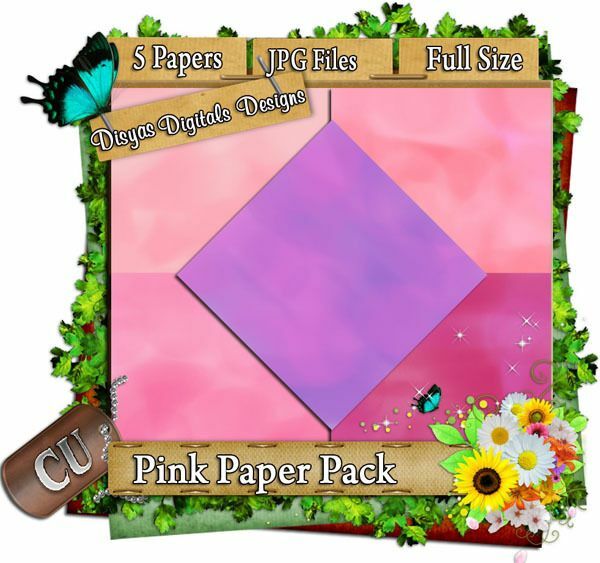 These paper packs, were made in soft shades, are full size, and are for commercial use. 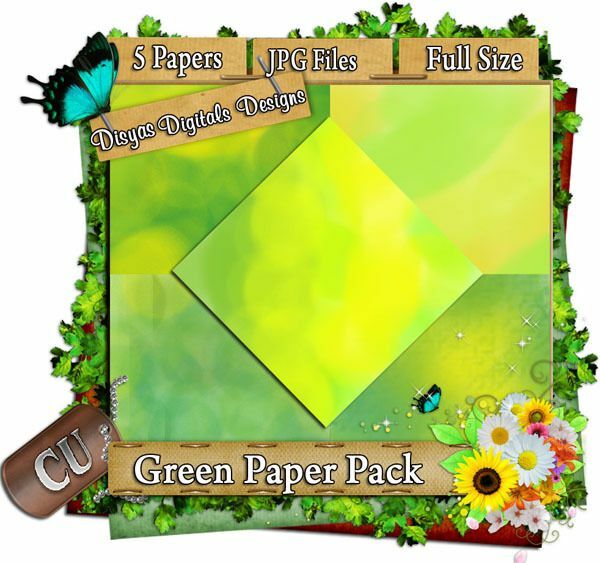 Enjoy this pack of beautiful green papers in soft shades mixed with yellow shades. 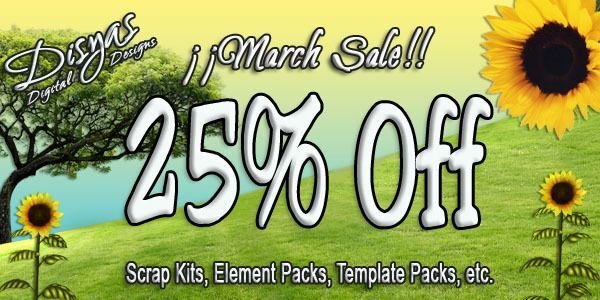 Are perfect for your scrap kits and projects. 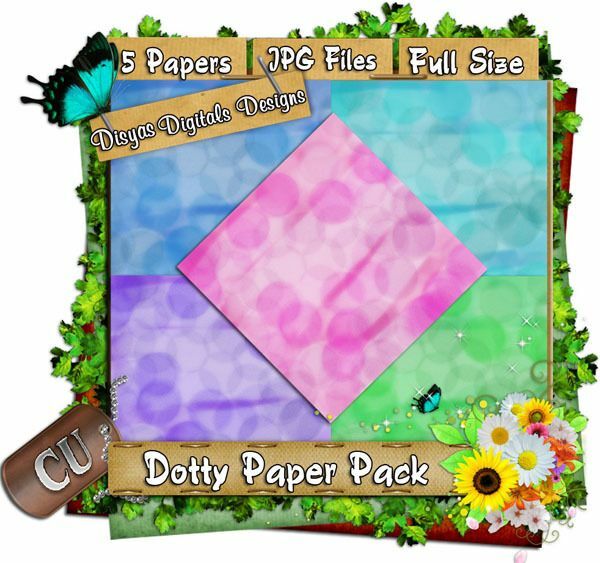 5 papers, full size, commercial use ok.
scrap kits and projects. 5 papers, full size, commercial use ok.